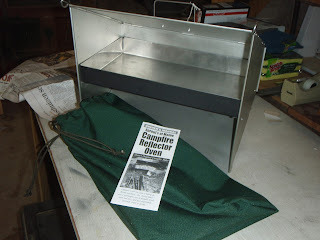 The Maine Outdoorsman: Reflector Oven Cooking with the "Sproul Baker"
Reflector Oven Cooking with the "Sproul Baker"
I am regularly impressed by the quality of Maine based products found throughout the state. You certainly do not have to look very far to find skilled craftsmen plying their trade out of small shops, building superior pieces of handmade merchandise. These individuals have honed their skills over decades and are masters of their craft. Because of the huge number of craftsmen, around the state, creating truly exquisite pieces of what I would categorize as “art”, I am always on constant alert as to what could be the next new and interesting Maine made outdoor product. Enter the innovative Maine company campfirecookware, located in the town of Bowdoinham, Maine. Here operating out of a small workshop, proprietor and master metalworker Chas Gill builds what can easily be described as simply the best campfire reflector oven on the market, the “Sproul Baker”. The "Sproul Baker" was originally designed and built by Harley Sproul from Lincoln, Maine. Harry was displeased with the quality and effectiveness of the reflectors ovens available on the open market and decided in the late 90's to build a reflector oven that worked properly. Harry’s initial idea for the “Sproul Baker” was based on historic sketches of reflector ovens used by woodsman, trappers and loggers in the 1800s, prior the modern cooking ovens. This original design was further improved upon by 7 years of research and development, fueled by a grant from Maine’s Institute of Technology. THIS TREMENDOUS EFFORT IN PRODUCT DESIGN AND PRODUCTION RESULTED IN THE BEST REFLECTOR BAKING OVEN AVAILABLE TODAY. Finally, in 2004 the “Sproul Baker” reached a point of perfection and the first ovens began being sold. After many years of success, Harley discontinued production and for a period of time it appeared that the infamous “Sproul Baker” might fade into oblivion. Thankfully, in the spring of 2011, after over a year of communications, Harry came to an agreement with current owner Chas Gill who took over the business in the fall of 2012, continuing the “Sproul Baker” legacy. What makes the “Sproul Baker” so wildly successful is its elegant and simplistic design. Easy to assemble, collapse and store it is truly a marvel of engineering. Its tinned steel construction makes it lightweight (2 lbs 4 ozs), rugged and sturdy allowing a single unit to be enjoyed by generations of outdoorsmen. THESE OVENS ARE INDIVIDUALLY HAND MADE FROM MAINE SOURCED PARTS AND ARE SUPERIOR TO ANY OTHER REFLECTOR OVEN AVAILABLE ON THE MARKET. What makes this oven so amazing is the quality construction and the care and attention to detail that goes into the creation of each unit. All the forming and assembly of the oven is painstakingly completed by hand, over the course of approximately 2 hours. The oven boasts many critical features, lacking in the “competition”. These include a baking pan coated on the sides and bottom with high heat black paint, allowing complete heat absorption to maintain proper baking temperatures. Also, an innovative handle that remains cool (not requiring the use of hot mitts!) enough to allow the unit to be picked up and moved to facilitate proper baking results. Lastly, the shiny interior surface of the oven provides complete reflection of heat from the flames of a campfire, allowing the oven to absorb heat better, allowing the ability to bake anything just like at home. FOR THE ULTIMATE CAMPING EXPERIENCE, MORE PEOPLE NEED TO EXPLORE THE REFLECTOR OVEN ALTERNATIVE! Reflector ovens have been around since the Maine woodsmen and river drivers started cutting Maine's forest down, starting back in the early 19th century. 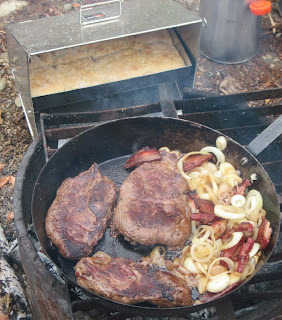 Almost all meals were prepared in the outdoors and the only way they could prepare baked goods was with the reflector oven. No better method has since been invented and with the proper procedure the results are always excellent. ENJOYING HOT BISCUITS COOKED IN A REFLECTOR OVEN IS A MAINE THING, ENJOYED BY A SELECT FEW. Chas is well acquainted with reflector oven baking from his many years, spent working at the Wilderness Bound camp owned and operated by Pierce Pond camps. Every summer Chas would lead groups of 12-20 campers on treks around the Allagash and Katahdin areas. Chas knew well that the key to a fun and enjoyable trip is the quality of food. During these adventures, Chas would use his reflector oven to bake biscuits, cornbread, brownies, cake, and even fresh raspberry and blueberry pies for the ravenous campers. Chas is currently working on recipe book based on Harleys Sproul’s original Reflector Oven cookbook! Need a few recipes to hold you over before Chas releases his new cook book? Why not try these two sure to please camping favorites! *Mix Bisquick, milk and cheese until a soft dough forms. Beat vigorously 30 seconds. Drop dough by spoonfuls onto a sheet of lightly greased aluminum foil cut to fit the shelf of your reflector oven. Bake 8-10 minutes or till golden brown. Mix margarine and garlic powder; brush over tops of warm biscuits. *Pour butter in 8-inch square casserole. Combine sugar, flour and milk. Pour over butter. Add fruit. Bake until golden brown. Please consider purchasing your very own SPROUL BAKER and make sure when you do to tell Chas Gill that the Rabid Outdoorsman sent you! Thanks! HEY CG! The oven really rocks! It cooked brownies to perfection in about an hour! Love your blog! Its almost hunting season down here, good luck! I have had a Sproul Baker since 2004. I bought it from Harley himself in Lincoln on my way to a bird hunting trip. I had a reflector oven from LL Bean previously that worked poorly at best. The Sproul Baker worked so much better it was amazing! We have made dozens and dozens of biscuits in it and the baked stuffed partridge breast is like a Thanksgiving turkey feast in the forest! Excellent! I was so glad to see the Sproul Baker has returned for sale again. I just bought another one! You haven't really camped until you have had a 2 and a half inch tall hot buttered biscuit made from Harley's "River driver biscuit mix" recipe with your baked beans and some bread and butter pickles!! Good stuff! It will work great right in front of the fire, actually even easier that outside I think. So if the power is off, or if you just want to use the fireplace heat, its awesome. The temp of the reflector oven is regulated by your fire, but primarily by moving the oven closer and furthur. Its easy to get the hang of it. can you bake a loaf of yeast bread, like wheat or rye bread in this? ABSOLUTELY Beth and have done so on many occasions!